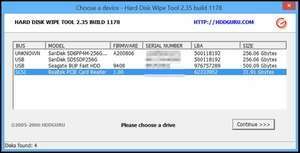 HDD Wipe Tool is a basic and rather outdated hard drive eraser which will completely remove all data from a hard drive. It supports most SATA, IDE and SCSI drives. Along with the above mentioned compatibilities, HDD Wipe Tool should also be able to wipe the content from other drives connected through USB or Firewire. Once the process of wiping has completed, the data that existed on the medium should not be recoverable. Version 2.35.1178 is a freeware program which does not have restrictions and it's free so it doesn't cost anything. For security reasons, you should also check out the Hard Disk Wipe Tool download at LO4D.com which includes virus and malware tests. Additional screenshots of this application download may be available, too. 4 out of 5 based on 55 ratings.